If you cannot find an answer to your question in the frequently asked questions listed below please call or email us and we will do our best to get you the answer. Q: What are the benefits of buying Spirit Plus Nutrition Maximizer feeds? Q: What differences can I expect to see in my horses, and how soon, if I feed them SPN Custom Slick Mix 500, or SPN Maximizer feeds? Win More 4-H & Open Show, Classes & Timed Events. Q: How does SPN Custom Slick Mix 500 differ from all of the other horse mineral-vitamin supplements? Chelated Trace Minerals, which are 3 to 5 times MORE AVAILABLE to the horse than trace minerals from sulfate, carbonate, or oxide sources. 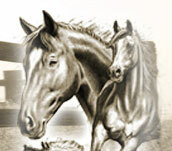 A full spectrum of B-complex vitamins balanced for the nutritional needs of horses of all ages and breeds. Digestive Therapy not found in any other equine supplement, that provides the synergistic benefits of yeast cultures, probiotics, and Suppli-mix. Q: What is Digestive Therapy & why is it important to me and my horses? A: Digestive Therapy is the synergistic effect brought about by combining the proper levels, & proper strains, of yeast cultures, probiotics, and Suppli-mix. Digestive Therapy is important for you and your horses because, hay and grains often loose a lot of their digestibility through improper harvesting and storage. Digestive Therapy in SPN Custom Slick- Mix 500, provides the essential products that promote therapeutic action in your horse’s digestive system. This will cause your horse to get the most out of digestion and nutrient absorption, leading your horse to it’s maximum potential in growth; body form; speed; endurance; reproduction, & all-around health. Most stables that keep records on feed consumption, report a 10 to 15% savings in feed, when using SPN Custom Slick- Mix 500, or feeds containing SPN Custom Slick- Mix 500. Q: Who made this great looking website?